While Venice hosts boating events all year-round, it is the warm days of May that kick-start the boat racing season. The best-known of these races is the Vogalonga, a rowing competition that accepts competitors from around the world, held in late May or early June. For information about the festivals and events that happen each May in Venice, read below. Note that May 1, Labor Day, is a national holiday, so many businesses, including museums and restaurants, will be closed. Many Italian and European tourists take advantage of the holiday to visit Venice making popular tourist sights especially crowded on May 1. 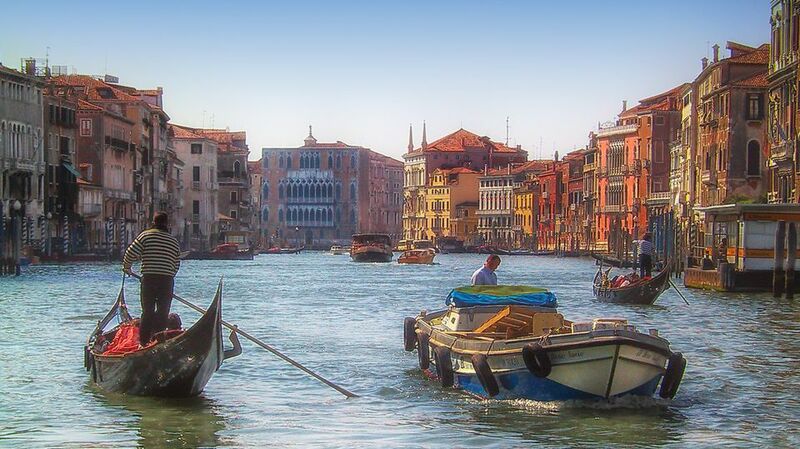 May is also generally considered high season for Venice hotels. Primo Maggio is a national holiday in Italy, so many Venetians head out of town for a long weekend. Those who stay in town get to witness the Festa Della Sparesca, a gondolier regatta held at Cavallino in the lagoon. While some Venetians leave town, many more tourists arrive, making Saint Mark's Square extremely crowded. If you are in Venice on May 1, you're probably better off avoiding Venice's top tourist attractions. Mid May - Festa della Sensa. The Festa della Sensa, the ceremony which commemorates Venice's marriage to the sea, takes place on the first Sunday after Ascension Day (the Thursday that is 40 days after Easter). Historically the doge performed the ceremony, held in a special boat, of marrying Venice with the sea by throwing a gold ring into the water. However today the ceremony is performed by the mayor who uses a laurel wreath. Following the ceremony, there is a big boat regatta and the day also usually includes a huge fair. Mare Maggio, held for 3 days around the middle of May, is a newer festival although it still includes historical re-enactments and traditions related to boating and the city's naval glory of the past. It's held inside the Arsenale, so it's a great chance to see inside the city's military zone. The Vogalonga held the weekend following the Sensa festival, is an exciting 32-kilometer rowing race that includes several thousand participants. The course runs from the San Marco Basin to the island of Burano, the half-way point, and returns through the Grand Canal to finish at the Punta della Dogana in front of San Marco. This is one of the top water festivals in Venice, and it draws participants from many parts of Italy and beyond. It's fun to watch, too. Because the date of the Sensa festival changes each year, the Vogalonga sometimes takes place in early June instead of May. Note that June also starts off with a holiday, the Festa della Repubblica, on June 2. Continue Reading: What's On in Venice in June or check the Venice month-by-month calendar to see what's going on in the month you plan to visit.